Reading is an activity that has no age. We begin reading to our babies when they’re in the womb, and we continue through infancy, into toddlerhood, and through school age, until they’re reading on their own. How do you speed up the process of learning to read, and get your child interested in books at a younger age? Letter of the Day. Each day, announce to your child which letter is this day’s letter of the day! If you decide to start with “A”, you can greet them with a large “A” cut from construction paper, and ask if they’d like to design it. From there, help them to make an “A” sound. Then, throughout the day, point out anything you see which begins with “A”, from apples to your child’s alligator t-shirt. Each time, emphasize the “A” sound in “a-a-apple”, and your child will learn which sound corresponds with each letter by the end of 26 days. Rhyming. Moving on to rhyming can be very fun for you and your child! Point out when different words rhyme, like “cat” and “bat”. 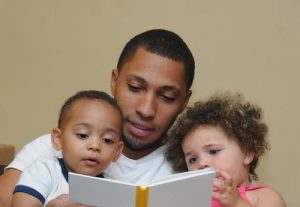 Be sure to emphasize rhyming words in your child’s favorite books and songs. Eventually, your child will be able to see the word “cat”, and when you switch the “c” for a “b”, she’ll know that you’ve just made the word “bat’! Read together. Making your reading time together special is one of the key ways to develop early learning skills in your child. When you’re reading an exciting book, be sure to do all of the voices and get your child laughing. When you’re reading to relax, snuggle up with a blanket and a snack. As your child associates reading with fun and closeness, she’ll become more attached to reading as an activity. Read separately. Let your child see you reading on your own, and explain to him, if he asks, that you like to read a book quietly to yourself. Encourage him to look at the pictures in his books on his own, and tell him that he can scan the words to find simple words he may recognize. Don’t push it. Is your child not quite picking up on rhymes or pronunciation? Does he wriggle away from reading time in pursuit of more active tasks? Don’t put too much pressure on him. That will only associate reading with negative feelings. He will eventually begin to become more interested in reading with you. Have you learned any effective techniques for engaging your children in reading, or helping them to learn more about the letters and words on the page? Let us know in the comments section! Interested in what else Child’s World Academy can do for you and your child? Contact us today for more information!